Definition at line 484 of file compat.h. Definition at line 387 of file winternl.h. Definition at line 503 of file compat.h. Referenced by ConvertThreadToFiberEx(), CreateRemoteThread(), LdrpInitializeProcess(), and RtlActivateActivationContextEx(). Definition at line 438 of file winternl.h. Definition at line 489 of file compat.h. Definition at line 488 of file compat.h. 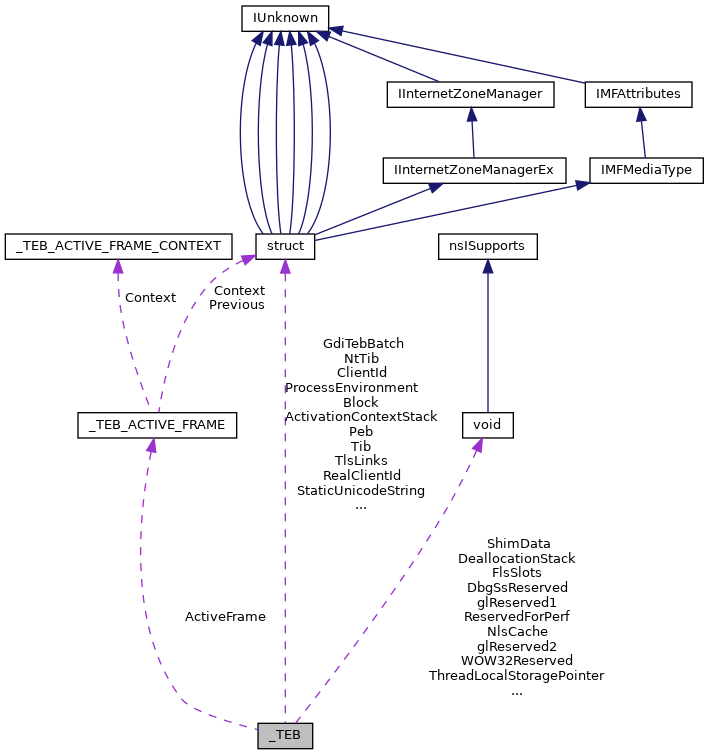 Referenced by CsrApiRequestThread(), CsrConnectToUser(), LdrLoadDll(), LdrpInitializeProcess(), RtlApplicationVerifierStop(), and RtlpDphProcessStartupInitialization(). Definition at line 493 of file compat.h. Definition at line 494 of file compat.h. Referenced by CsrApiRequestThread(), and CsrConnectToUser(). Definition at line 344 of file ntddk_ex.h. Definition at line 498 of file compat.h. Definition at line 437 of file winternl.h. Definition at line 532 of file compat.h. Definition at line 527 of file compat.h. Referenced by ConvertThreadToFiberEx(), LdrpInit(), main(), MiCheckForUserStackOverflow(), and PspExitThread(). Definition at line 487 of file compat.h. Definition at line 348 of file ntddk_ex.h. Definition at line 502 of file compat.h. Definition at line 439 of file winternl.h. Definition at line 499 of file compat.h. Definition at line 536 of file compat.h. Referenced by ExtTextOutW(), GdiAllocBatchCommand(), KeUserModeCallback(), NtGdiFlushUserBatch(), PolyPatBlt(), and START_TEST(). Definition at line 393 of file winternl.h. Definition at line 509 of file compat.h. Definition at line 511 of file compat.h. Definition at line 512 of file compat.h. Definition at line 513 of file compat.h. Definition at line 392 of file winternl.h. Definition at line 508 of file compat.h. Definition at line 391 of file winternl.h. Definition at line 507 of file compat.h. Definition at line 506 of file compat.h. Referenced by ExtTextOutW(), GdiAllocBatchCommand(), NtGdiFlushUserBatch(), PolyPatBlt(), and START_TEST(). Definition at line 514 of file compat.h. Definition at line 359 of file ntddk_ex.h. Definition at line 523 of file compat.h. Definition at line 522 of file compat.h. Definition at line 516 of file compat.h. Definition at line 401 of file winternl.h. Definition at line 517 of file compat.h. Definition at line 518 of file compat.h. Definition at line 520 of file compat.h. Definition at line 519 of file compat.h. Definition at line 521 of file compat.h. Definition at line 533 of file compat.h. Definition at line 378 of file ntddk_ex.h. Definition at line 436 of file winternl.h. Definition at line 432 of file winternl.h. Definition at line 534 of file compat.h. Definition at line 433 of file winternl.h. Definition at line 492 of file compat.h. Referenced by EngSetLastError(), and TlsGetValue(). Definition at line 524 of file compat.h. Definition at line 434 of file winternl.h. Definition at line 332 of file ntddk_ex.h. Referenced by ConvertFiberToThread(), ConvertThreadToFiberEx(), CreateProcessInternalW(), DbgkCreateThread(), DeleteFiber(), KeUserModeCallback(), LdrpInit(), LdrpMapDll(), LdrShutdownThread(), MiCheckForUserStackOverflow(), and RtlWalkFrameChain(). Definition at line 376 of file winternl.h. Definition at line 491 of file compat.h. Definition at line 337 of file ntddk_ex.h. Referenced by GdiQueryTable(), GetModuleHandleA(), InitThreadCallback(), KiPrepareUserDebugData(), KsecGatherEntropyData(), MyGdiQueryTable(), and TlsAlloc(). Definition at line 510 of file compat.h. Referenced by CsrApiRequestThread(), LdrLoadDll(), and START_TEST(). Definition at line 147 of file winternl.h. Definition at line 149 of file winternl.h. Definition at line 150 of file winternl.h. Definition at line 152 of file winternl.h. Definition at line 542 of file compat.h. Definition at line 155 of file winternl.h. Definition at line 531 of file compat.h. Definition at line 540 of file compat.h. Definition at line 435 of file winternl.h. Definition at line 501 of file compat.h. Definition at line 537 of file compat.h. Definition at line 422 of file winternl.h. Definition at line 538 of file compat.h. Definition at line 423 of file winternl.h. Definition at line 539 of file compat.h. Definition at line 349 of file ntddk_ex.h. Definition at line 504 of file compat.h. Definition at line 526 of file compat.h. Referenced by BuildUserModeWindowStationName(), DbgkCreateThread(), and LdrpLoadImportModule(). Definition at line 525 of file compat.h. Referenced by BuildUserModeWindowStationName(), and LdrpLoadImportModule(). Definition at line 500 of file compat.h. Definition at line 505 of file compat.h. Definition at line 490 of file compat.h. Referenced by LdrpAllocateTls(), and LdrpFreeTls(). Definition at line 486 of file compat.h. Definition at line 156 of file winternl.h. Definition at line 543 of file compat.h. Referenced by LdrShutdownThread(), NtSetInformationThread(), TlsAlloc(), TlsGetValue(), and TlsSetValue(). Definition at line 529 of file compat.h. Definition at line 528 of file compat.h. Referenced by NtSetInformationThread(), TlsAlloc(), TlsGetValue(), and TlsSetValue(). Definition at line 399 of file winternl.h. Definition at line 515 of file compat.h. Definition at line 530 of file compat.h. Definition at line 541 of file compat.h. Definition at line 496 of file compat.h. Referenced by CsrApiRequestThread(), InitThreadCallback(), and START_TEST(). Definition at line 495 of file compat.h. Referenced by GdiAllocBatchCommand(), GdiDeleteBrushOrPen(), InitThreadCallback(), and UserDbgAssertThreadInfo(). Definition at line 535 of file compat.h. Definition at line 497 of file compat.h.